Instead of blogging about an adventurous night in the kitchen, I'd like to share one of my favorite tomato dishes in honor of an important cause. 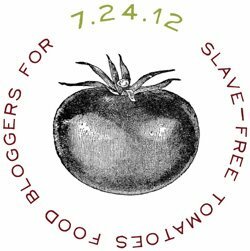 I was asked by my friend and fellow social activist Luis Gomez to join other food bloggers in raising awareness for Slave-Free Tomato Day. Most of us rarely stop to consider where our food originated and how it made its way to our plates. We often think of widespread controversial labor issues as a thing that happens overseas or in third-world nations. But right here in the tomato fields of Florida, where a huge portion of America's tomatoes come from (up to 90% in the winter), immigrant workers are being subjected to harsh working conditions, brutal heat, long hours and shockingly low wages. Think about the cost of tomatoes where you shop. You're likely to be paying anywhere from $3 to $5 for a small carton of cherry tomatoes, and around $2/lb or more for most vine-ripened tomatoes. 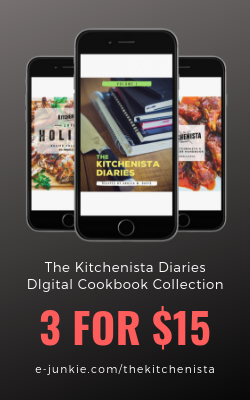 Now what if I told you those same tomatoes are often picked by a laborer being paid no more than 50 cents per 32 pound bucket of tomatoes collected, and even then may have been cheated out of full pay for a day's work? Let that sink in a little bit. So what can you do? Educate yourself about ongoing labor injustices for tomato workers on tomato farms such as those in Immokolee, Florida and demand that the establishments you frequent endorse the Fair Food Program. Take action by sending a message to the executives of the major grocery chains who stand on the wrong side of labor rights, or start a petition to let your local store know that members of your community demand change. Participate in local demonstrations and protests organized by local activist groups. 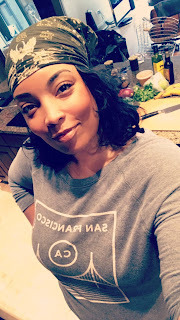 Most importantly, strive to purchase locally grown, in-season tomatoes and ensure that you are buying slave-free tomatoes such as those sold by farmer's markets, CSA's, and grocery stores that have endorsed the Fair Food Program. Together, we can help the people of Immokolee and all other tomato workers who make it possible for us to put meals on the table for our families every day. Slice or dice tomatoes to similar size. In the picture above, I used halved yellow cherry tomatoes and diced plum tomatoes. Whatever you have works! If using whole tomatoes, you will need to de-seed them prior to dicing. 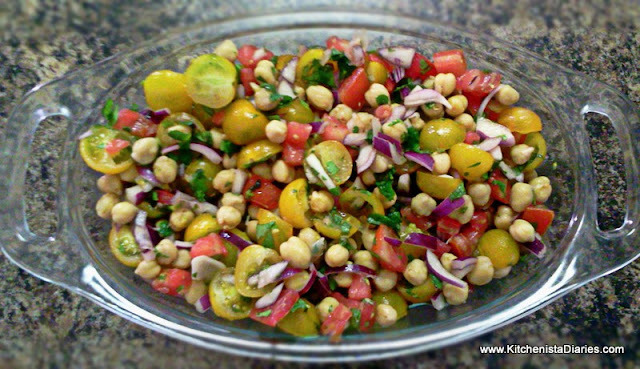 Combine the tomatoes, chickpeas and onions in large bowl. Chiffonade basil & mint leaves and finely chop the parsley to yield 3 to 4 tablespoons of chopped herbs. Feel free to add or substitute other fresh herbs if you have something else on hand. Cilantro or oregano would also work well. In a small bowl, whisk together the vinegar, lemon juice and a pinch of sea salt. Slowly whisk in the olive oil. Add the chopped herbs. Toss the tomatoes, chickpeas and onions with vinaigrette. Season with sea salt to taste. Can be served cool or at room temperature.